Lead and direct the delivery of strategies to ensure efficient, cost effective highways, transportation and waste networks. Direct improvements across public highways in Kent including improvements in safety, condition operation and congestion reduction. Lead the delivery of the concessionary fare scheme, rural bus schemes and Young Person's Travel Pass. Direct and deliver strategies to ensure cost effective partnerships are in place to deliver waste services and contracts across Kent, maximising commodity value and income generation. Direct the delivery of all strategies ensuring cost effective and quality assured partnerships are in place to deliver effective and seamless services. Lead and oversee the commissioning strategy for all future service requirements in partnership with 12 Kent Districts and South East 7 authorities. View the job description (PDF, 151.0 KB). Simon joined KCC in July 2018 as the Director, Highways, Transportation and Waste. 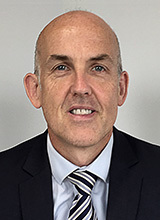 Previously, he had spent 6 years as a senior civil servant, operating as the Regional Director for the South East and M25 with Highways Agency then, since April 2015, with Highways England. Before becoming a civil servant, Simon spent a year with Lend Lease operating within their sector business looking rail and transportation development opportunities. He spent over 15 years within the rail industry providing high speed and mass transit signalling and train systems both nationally and internationally. He was the global Project Director for Alcatel’s Transport Solutions Division and more recently he was the Thales Rail Signalling Solutions Project Director for the Jubilee, Northern and Piccadilly Line Upgrade Project in London as well as the Managing Director for the UK rail business. He is a Chartered Quantity Surveyor having been a member of both the Royal Institution of Chartered Surveyors and the Chartered Institution of Civil Engineering Surveyors for almost 20 years. Simon has not claimed any expenses for the past financial year.